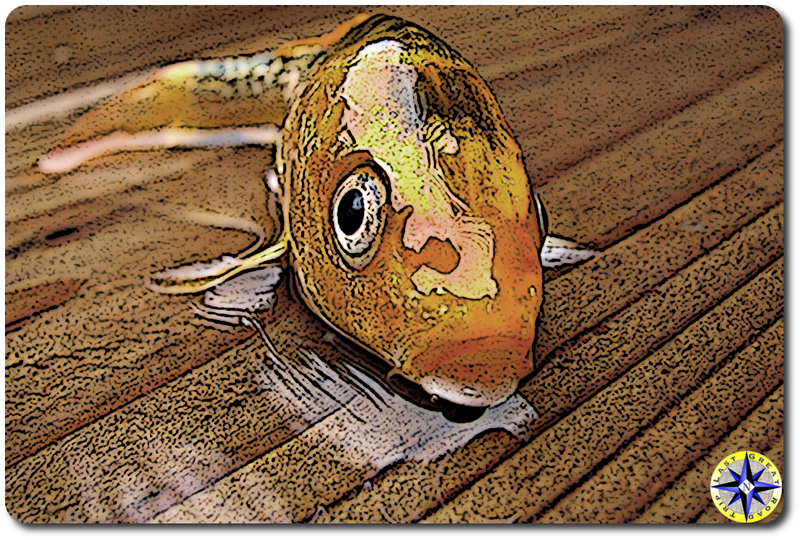 Ok, Let it out… and breath. 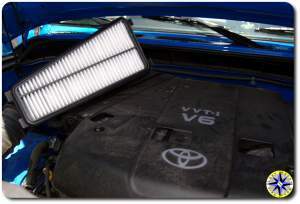 How to change your Toyota FJ Cruiser’s engine and cabin air filter. When your FJ Cruiser can’t draw in the fresh air it needs, your engine runs less efficiently, gas mileage plummets and horse power evaporates. The easiest way keep your engine running at peak performance is to regularly check the air filter and change it when it becomes filled with dirt and debris. 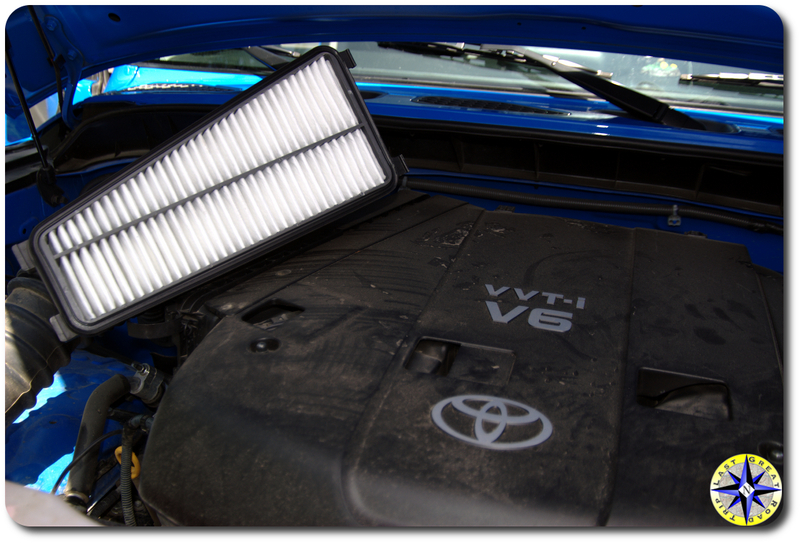 Depending on where you live, how you drive and where you take your rig off-road, your maintenance schedule including the engine’s air filter can change. At a minimum, the air filter should be checked with every oil change and replaced (or cleaned if its a reusable filter) every 8000 miles. The lessor known and often over looked cabin filter should also be replaced. 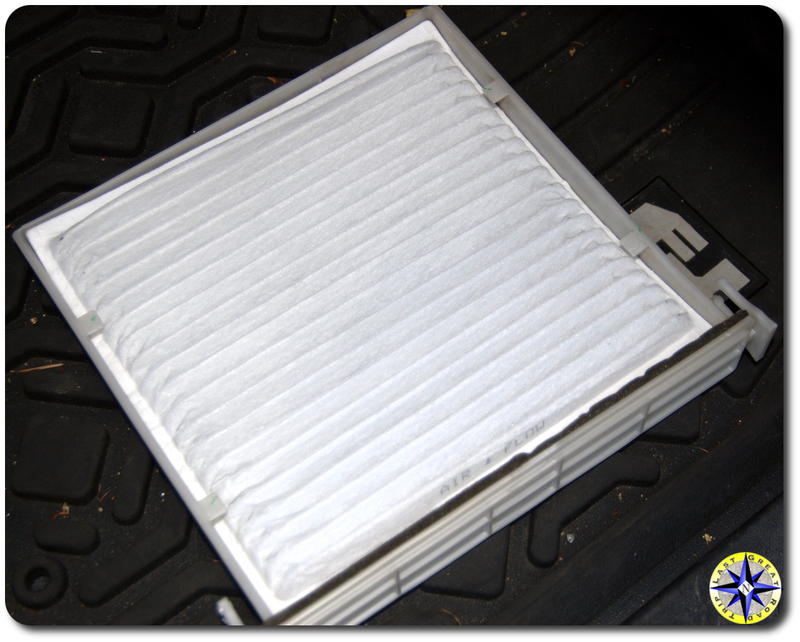 A dirty cabin filter can contribute to the pollution circulating inside the rig and place an unneeded stress on the air condition unit which may work over time trying to cool the interior. Luckily for FJC owners, the factory engine and cabin air filters on the FJ Cruiser are one of the easiest maintenance items to perform. 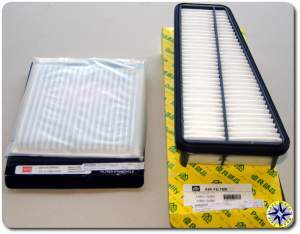 Each takes only a couple of minutes and with a little on-line shopping, an FJ Cruiser engine air filter can cost less than $15. Lift the hood, locating the air filter housing and the two clips that hold it in place. 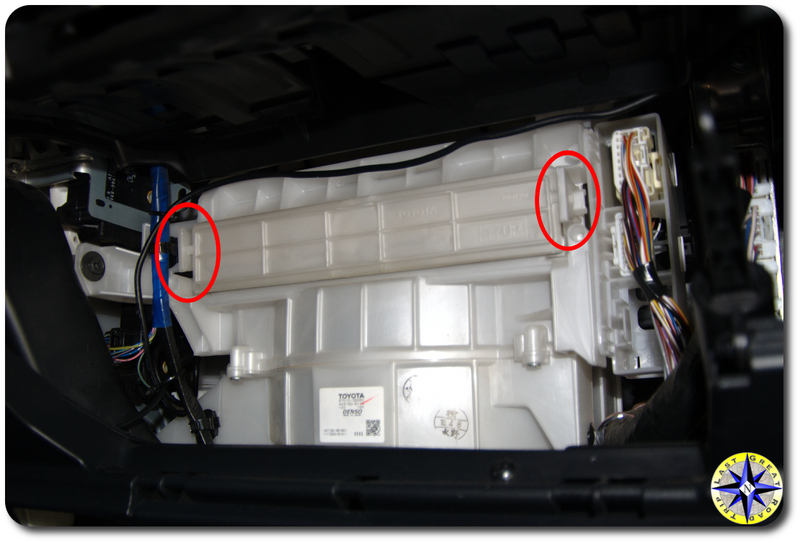 Flip the two clips open releasing the air filter housing and allowing you to pull it away from the engine and exposing the air filter inside. The filter, although fitting snugly inside the housing, lifts directly out. After pulling out the old dirty filter, simply drop in the new clean one into the housing. slide the housing back into place and re-secure the clips holding the air filter housing to the engine. That’s it. Your done. Really… Two minutes tops and your engine will thank you, it can now pull in all the air it needs to achieve the most effective air fuel mixture creating the combustion that will power the rig at peak performance. Now that you mastered the engine air filer and are on a roll it is time to move to the interior. 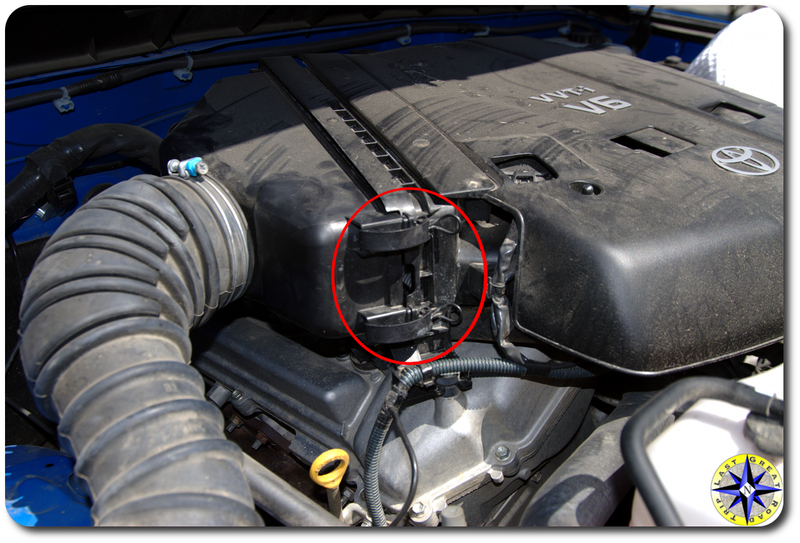 The FJ Cruiser cabin air filter is hidden behind the glove box. 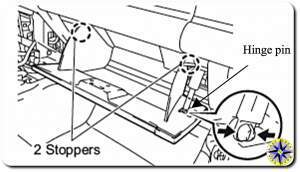 Remove the glove box by unclipping the hinge pin and than pressing in on the sides of the glove box as it lowers down past the stoppers. The cabin air filter is inside the fan housing that is now exposed. By pressing the two clips on the face of the fan housing will you can remove the filter tray. Remove the old filter from the tray and replace it with the new one. The filter is flexible and will slide under the retaining clips on the tray. That is all there is too changing the cabin air filter. And depending on how dirty the filter was, you should notice an improvement in the air flow the next time its hot and you need turn on the AC. 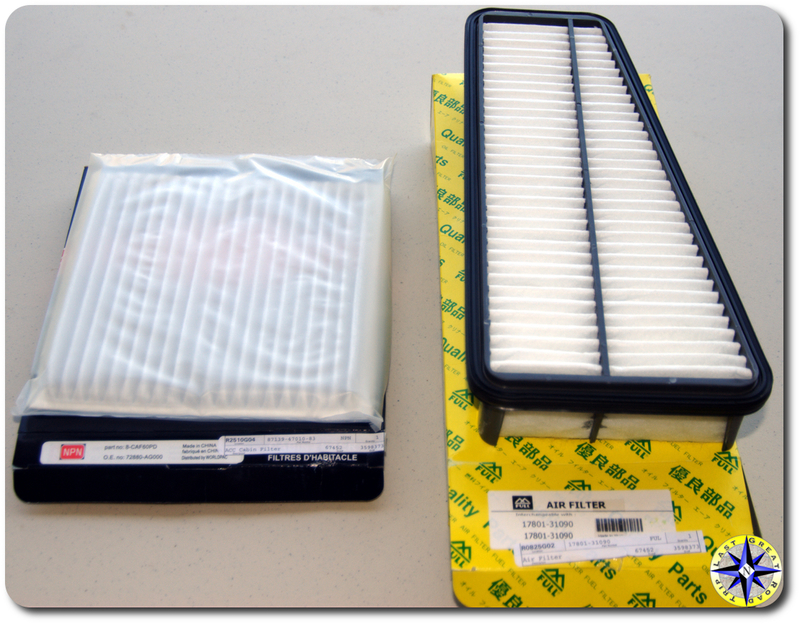 You can also save money by making your own cabin air filter. Thanks for the tips. Very clear and easy to understand, even for a car-clueless person like me (all I can really do is change the oil). 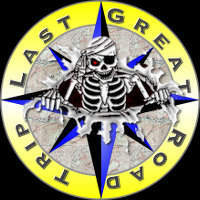 I may just link to this page from my road trip website. And then I think I need to go check my air filters….